Why did 620 people show up in Silicon Valley to see and hear founders and leaders of some of our favorite Internet companies talking with well-respected teachers of mindfulness and neurosciences specialists last month? 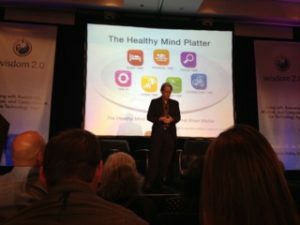 There’s a growing concern and recognition that our brains and minds are on overload these days, and are being investigated with increasing curiosity, and accuracy… there’s increasing acknowledgment that we are, in fact, being adversely effected by the bombardment, and sheer volume, of information we are living amongst. We are connecting and not connecting, getting more done and, well, not really getting more done. And if there’s something to be done with all of this information you can bet the folks in Silicon Valley want to be involved. The outstanding reason that these technologists and mindfulness leaders were in the same room is that those who work the long hard hours to innovate and produce profitable companies realize that a clear mind — a focused mind — is a creative and innovative mind. And there’s a good dose of philanthropic energy there too since many of those great minds have amassed the wealth with which to change the world and many of those successful people in Silicon Valley actually want to change the world for the better. It turns out that a calm and mindful approach is highly correlated with a compassionate and peace leaning mind. So if the folks in Silicon Valley, the people who have created the very things that have changed the way do business and life are paying attention to this, shouldn’t you too? How do you clear your mind to increase focus and be more innovative in your thinking? How do you press pause when the work and life you lead is draining you dry? Think the person who snapped at you (or was that you who snapped? ), the boss or coworker who just stole your idea and threw you under the bus are aware of their impact? Could a little more kindness in your life make for more effective collaboration and genuine communication?